Mega Power's Triples Diesel Fuel Injector Cleaner, Motor and Combustion Cleaner, Engine Conditioner Protector. When engine performance trouble shows up, dirty engines internally cause most problems, but most people just clean their fuel injectors. If you're the type that sees cleaning the entire engine at the same time, Mega power is what you need to order. In the fuel tank, removing gum and moisture, and sends it to the combustion cycle to burn off carbon, as it cleans your fuel injectors. Mega Power's Diesel Fuel Injector Cleaner Treatment then adds its famous MC+ friction modifier and slippery film to worn surfaces. This transfers horsepower faster thru the engine and to the wheels - while producing a quieter, stronger running engine - no matter age, or mileage. This is really diesel injector cleaner cleaning of the highest order! You can order the whole engine Diesel Engine Treatment 6 item here or singles in 12 oz and gallons, down below. Add this to your car pickup fuel and motor oil to protect it, end this motor's dirty caused trouble. Add to good running vehicles you want to slam the dirty wear ending trouble developing in them at higher mileage. Click to order the car 6 item treatment described above Just $90 plus $15 s&h= $105 total Shipped tom your door with directions, phone help free if needed, guarantee. Order this item: Click cart button. However, what about the rest of the motor. What I mean by that is this. You wash your hands many times each day. Usually take a shower once a day to clean your entire body of toxins and sweat. What about the same for your motor and transmission? - At a dealership. The service writer rights up your order, and a mechanic checks on the trouble. Solution? Fuel injector cleaning needed - Cleaning can run from $250 to over $400. That's one way to put your motor back right. A device hooked up to the fuel system and feeds strong cleaner into the injectors, to do so. You pay the bill and drive off glad, it didn't cost you more! - Do it Yourself: The other is by use of Do-it-yourself products. Among the best is Mega Power's Injector Cleaner - but its pricey - at about $100, compared to other products that sell from $10 to $69, and for good reason. Mega Power's Triples Diesel Fuel Injector Cleaner Protector. Mega Power Diesel Injector Treatment is a triple action cleaner and worth its price. That's because, like a shower, its a whole motor cleaner. Mega Power's Triples Diesel Fuel Injector Cleaner Protector also cleans, anti wear's these costly to repair engine parts. Solvents clean well, to well! They strip the system of muck, washing it into the combustion process. This can gum up piston rings, which then allows more combustion to escape and mix with the motor's oil. See downward pointing arrows. A sludge maker, for sure. Valve tapping and nosier sounding, faster wearing conditions results from that. Most people and most mechanics think that's normal. However, a couple years down the road a $5000 engine overhaul often results from friction and acids doing their harmful thing - but not in my motor! Discussed elsewhere on this site, Mega Power cleaners are chemical cleaners with lube value that smooth acid pitted surfaces - a problem in some diesels. Cylinder pitting can create holes at around 400,000 miles and requires extensive work to replace cylinders and pistons which are the weakest parts, and leak oil. Triple Action Diesel fuel Injector Cleaner with Tune up and lube value that neutralizes acid pitted surfaces to prevent such future troubles. Triple Action Diesel fuel Injector Cleaner with Tune up and lube value that neutralizes acid pitted surfaces to prevent such future troubles... that liquefy sludge turning sludge into clean burnable power, having a piston rings cleaning feature. A horsepower boosting value that eliminates black smoke and Hi-emissions. Tune up chemical Diesel Fuel Injector Cleaners with lube value that smooth acid pitted surfaces, and friction modifies. Slams the breaks on wear out so you can go a million miles - hopefully with Mega Power Triple Action Diesel fuel Injector Cleaner. i cal it a a great Mega Power Triple Action Diesel fuel Injector Cleaner treatment. Fuel economy adds 20 to 40 more miles distances each fill up. That alone pays for most or all of the product avoiding $250 to $400 the dealer or repair shop will charge you. So, for those who believe in such help, we guarantee you can feel the improves mention or we will refund your purchase price. How's that sales pitch go with you? $99 for cars and pickups. Conditioner, and friction modifier. All product features your engine surly needs. 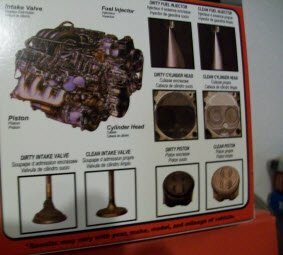 So, its not pricey - but will save you from taking apart the engine to clean up. Just about $400 for big diesels. Under $100 for small engines. What you don't know about your engine, Mega Power does and supplies it in its diesel fuel injector cleaner and engine treatment. The six item package shown. Shown, the treatment with 6 items works in 2 easy steps to correct your motor dirty caused malfunctions. Mega Power's Triples Diesel Fuel Injector Cleaner Protector cleans, anti wear's all your engine parts in 2 steps. Step One cleans from fuel tank to exhaust tip, and every where fuel and exhaust go. The reason for it stopping black smoke, and lousy fuel economy. Oh yes, its a natural cetane booster and horsepower booster and most diesel owners say increase power and fuel economy by 10 to 12%. Step Two cleans what step one can't get to. This includes every part wherever oil goes. Then frees them so they slide smoothly again, after returning their worn surfaces to a smooth friction removed operation. A co-polymer then fill worn spaces. This makes them operate nicely again. With just 2 complaints over the last 267 days, we decided to offer Mega Power on a 100% money back guarantee to let others enjoy Mega Power advantage testing its claim and benefits with no risk - if your car needs actual repair - instead of just a good cleaning. And as Mega Power diesel fuel injector cleaner works, it removes engine carbon, and frees piston rings an sticky valves - all negatives that must be removed for ending black exhaust smoke - and to restore strong hill climbing power. Results improve fuel economy, and for smoother quieter engine running - customers tell us. 2 ways to clean your injectors. Clean injectors and your motor. Now you have a two choices: Just clean the injectors - with our Diesel Fuel Injector Cleaner for cars and pick-ups. Shown here. Just add it to the fuel tank. Order just the injector cleaner. Mega Power Fuel Injector Cleaner. One of 6 items in our Diesel Fuel Injector Cleaner. In pints - Cleans Diesel injectors when added to 10 to 25 gallons diesel fuel. $12 ec plus $5 s&h= $17 total. 6 pak of pints $60 plus $15 s&h= $75 total Save $12. Click cart button for this item. To do the total "tank to exhaust, motor oiling, an all in between fuel side and oil side of your motor,"order this 6 ingredients Mega Power Diesel Fuel Injector Cleaner Treatment for cars and trucks below. For large trucks diesel equipment, go here. Order the whole Diesel Fuel Injector Cleaner Engine Treatment. Order the car, pick up 6 pak of Diesel Injector Cleaner below. injector cleaners and receive our famous Mega Power Engine Treatment Conditioner you add to the oil. A $39 value- Free! Order Now! Bonus Special subject to end without notice. and Engine Conditioner 12 oz..
$150 plus $15 s&h= $165. BONUS for ordering Now! 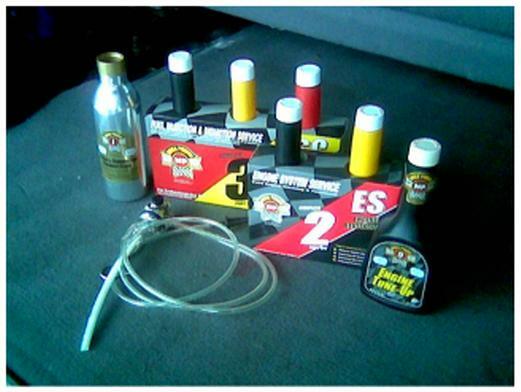 6 Free MP Engine Treatment 12 oz. Value: $190. Save More, Protect More and order now. Save $40. Just $165 Total, 30 items total, shipped FedEx to your door in 3 days. Click cart button to order this sale item. Order one Gallon Mega Power Diesel Injector Cleaner Conditioner $115 plus $15s&h= $130 total. Good for cars trucks heavy equipment. Three older diesel fuel products - found on parts store shelf's because Mega Power works better, is cheaper, avoids and ends common problems - other brands do not! Mega Power cleans and leaves no residue. Most diesel additives use a 35 year old detergent the government outlawed the fuel companies usage in fuel - because when it burned - it cleaned, but also left a sticky gum coating on the inside of the engine. Most gas station diesel additives are weak compared to Mega Power strength, and cannot continue cleaning pass the fuel injectors like Mega Power will. Store bought additives seldom if ever eliminate smoke because they cannot remove dirty interior surfaces which build up a carbon film - that acts a blotter to keep fuel liquid - in that state it burns incompletely. Mega Power ends that negative with its super strength to end smoking and revitalize lost power. Mega Power stops black exhaust smoke in minutes. And adds cold weather fuel flow and better starting in the coldest weather. No other additive does as much for your diesel car, truck, tractor, equipment, power generator. This type cleaning keeps fuel in fog spray removes the cause of fuel wetness - which burns poorly and causes black exhaust smoke. These advantages stops smoke and lowers emissions. Cleans the catalytic converters in the process. Often adds 20-50 more miles distance per tank. Pays for itself easily! Drivers report climbing hills a gear lower. Big rigs, equipment: Add a quart of Mega Power to 50 to 100 gallons fuel. Results last. Gallon size treats 35O gallons fuel. 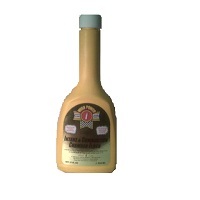 Order a 6 pak receive our famous Mega Power Engine Treatment Conditioner you add to the oil. A $29 valve- Free! order now! 24 MP D I C&C $150 plus $15s&h= $165. Free 6 MP Engine Treatments Save $190 offer subject to expire anytime. The right product for your diesel. You will see Mega Power end these problems. Mega Power ends black exhaust smoke, power lost, rough running, and fuel waste problems - in minutes by conditioning the fuel to flow better in coldest weather, keep fuel molecules from clustering, for a clean, longer burn time. You feel it working because more power is developed. Instantly cleans dirty fuel injectors, manifold and combustion residues - ends black exhaust and high emissions in minutes. As this picture shows, fuel injectors are not the only parts that are dirty. To clean these parts, several different products are needed. Mega Power Brand Diesel Fuel Injector Cleaner has the answer. Mega Power Fuel Injector Cleaner Cleans all these dirty Motor parts for a future trouble free motor. As you can see in the picture, many other areas of the motor are dirty and show wear, and these - if left dirty, cuts engine life in half. Mega Power returns the proper spray pattern to a fog-like spray. Most products can do that as well as Mega Power. Reducing actual friction drag and cleaning of valves is another matter. And, only Mega Power can help you with this. Friction drag increases over time and need reducing. Mega Power adds this benefit, exclusively. 12 to 24 valves, 4 to 8 combustion areas needs cleaning, and 12 to 24 piston rings all need cleaning. Mega Power adds this benefit also, exclusively. And cleans the fuel system. Removes condensation. Sweetens sulfur based fuels. Note the places fuel injector cleaner cannot get to in the picture below. There are products for these areas - like MC+ to reduce friction wear, as shown in the demo link, above. Wear-increasing residues on your valves, pistons and piston rings cause blow-by, the engine tap sounds, rough idle, and loss of power problems. Those faltering parts make the motor seem worn-out! But its not - as you can now see. This type cleaning is missed or ignored by most tune-up mechanics - but included in our Mega Power Diesel Fuel Injector Cleaner, for the conscientious mechanic and car owner who wants these advantages. When valve stems get gummed up with oil-breakdown residue, the tar-like, gummy residue [see left valve. I colored it gray to show sticky area] slows down the valves rapid closing speed. 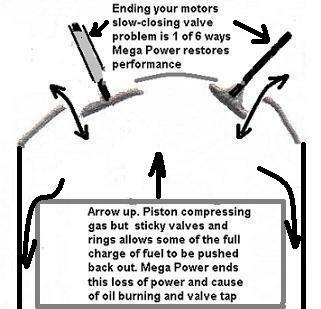 The drawing shows the common problem that they are still closing as the piston compresses the fuel. So, some fuel is squeezed back out. This is a major cause of various performance and power-decline problems - not dirty fuel injectors. To clean, free, smooth, and reduce friction on those and all other parts. It takes 6 products to clean top and bottom of the motor - because that is what works to end your car problems. The products needed were invented by Mega Power and packaged along with their fuel injector cleaner - we call this package a treatment. Shown below. Most mechanic skip or ignore those areas and just perform injector cleaning - which helps a little, to fool the customer. I know! I call on hundreds of mechanics and garages and many go for-the-profit-first idea - rather than serve the customer idea. So, I'll help you on this and get your diesel running as good as new, again. Diesel Fuel Injector Cleaner for cars and pick-ups. 6 products shown above, for top and bottom cleaning and protection. A Fuel Injector Cleaner goes in the fuel tank. A Combustion Cleaner goes into the PVC valve and throttle plate. A Friction Modifier goes into the oil. A week later, the other 3 products are installed during an oil change to finish bottom of motor cleaning, freeing, and protecting. No tools or special skills needed. Driving makes the product work in a few miles of driving. A great tune up in the 6 places - not just fuel injectors. Price: $60+ $15 S&H=$75 total, shipped to you with instructions. Our 3 part Diesel Fuel Injector Cleaner for cleaning fuel injectors and the top of the motor; valves, combustion, and piston rings. Mega Power #FI"D"- 3 Part. $30+ $15s&h= $45 total, shipped to you with instructions. --Simply add one product to the fuel tank and one to the motor oil, and install one into the PVC valve and throttle plates. Works as you drive in about 50 miles. Our, you-can-do-it Diesel Fuel Injector Cleaner is simple. Works as you drive in about 50 to 100 miles - guaranteed. Mega Power Older, Worn Motors #ES+"D"-6. 6 items. FREE SHIPPING WHEN ORDERING ANY 4 sets of PRODUCTS. USA. SAVE $60. Garages on the re-order monthly plan: Free shipping plus 26% off list: 12 sets. What will MEGA POWER DO for my motor? Mega Power ends these common problems if dirty, sticky wear and tear based. Cleaning with the Mega Power Brand, the brand we use and recommend, will restore your injector-fogging characteristics fast. They do the job right! DIRECTIONS that are included with your order - Plus you have my help by phone, if this is new to you. That's my expertise! And what I'm here for. Please Note" "D" letter=Diesel. "G" stands for gas version.